You are at:Home»Articles from Our Contributors»10,000 “Impossible” Novenas to St. Jude! 10,000 “Impossible” Novenas to St. Jude! 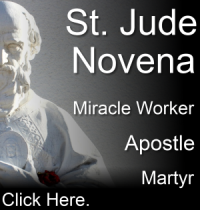 Starting Wednesday, October 19, I will be joining over 5,000 Catholics to pray the St. Jude Novena for a special intention and with so many faithful Catholics around the world praying this novena, I thought you’d like to join too. As you may know, Saint Jude is the patron of Hopeless Causes and Desperate Situations. The organizers of this Novena are trying to get 10,000 people to pray this novena together. Right now, there are about 5,200 signed up. Will you help me get more? + Go to the Facebook event here and invite all your Catholic friends. I hope you’ll join me to pray this novena together to St. Jude and that you’ll consider helping to spread the word.